Stone Planters and the Garden Centre. The Ageing and Weathering of Sandstone Explained. 2019 Price List and Picture Catalogue. How are Cast Stone Garden Products Made From Dry-cast Sandstone ? The term dry-cast, also known as reconstructed stone or reconstituted stone, is simply as it sounds; to use a dry mix to cast, using moulds to manufacture man-made sandstone. Strictly speaking the mix used to make sandstone is not totally dry or it would not hold together. It is semi-dry or moist, although dry-cast is a better description of the process used. 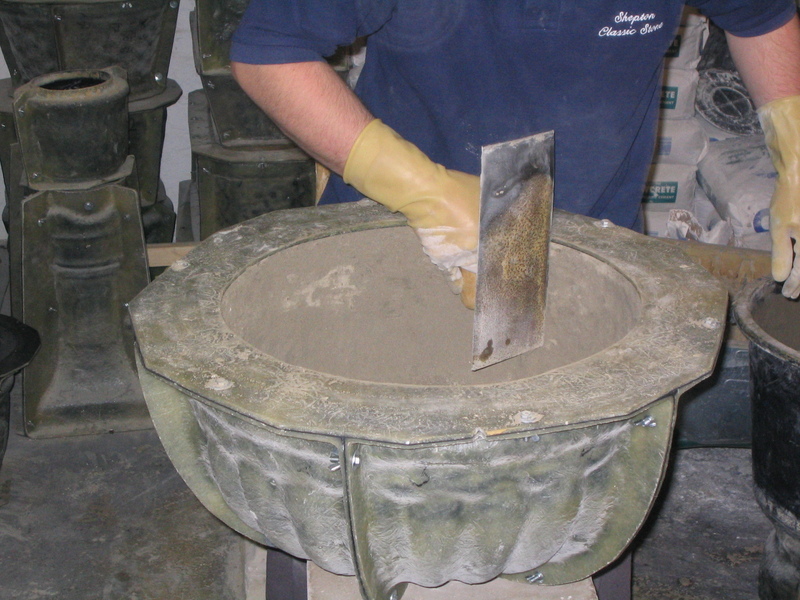 One of the most common methods of manufacturing items that need to be like a type of stone is known as wet-cast or wet-mix, more commonly known as concrete, often produced by pouring the mixture of aggregates and cement into a mould and then using a vibrating platform to remove any excess air. The production of dry-cast sandstone is generally a more hands-on process and is often more time consuming. The mixture used will not pour and would merely jump around if placed onto a vibrating platform. In order to manufacture using this method, the mix has to be worked into the mould in a more methodical way, using a selection of rather primitive tools. The reason stoneware is often called handmade stoneware is because the mix is literally hit into the mould by hand and requires a certain amount of skill to make a good quality product. 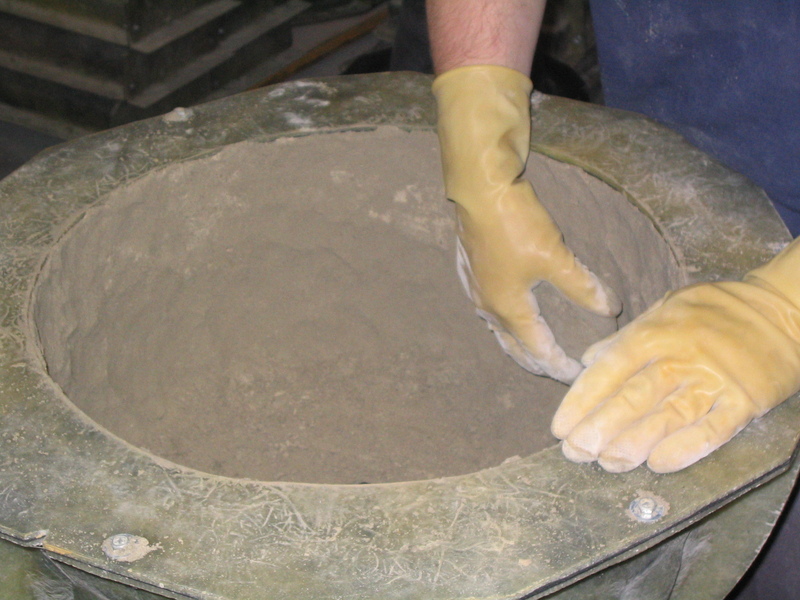 Although hand-making tends to be necessary to make items such as one piece urns and certain other items, a lot of stoneware nowadays is made using an air rammer to hit the mix into the mould. This is a quicker method of production, though care must be taken in order to make a good quality product. If the mix is over-hit or hit too hard, the item will tend to crack, or if it is under-hit some of the design or pattern will be loose or missing. So far no manufacturer has managed to remove all the skill required to make stoneware, hence the high prices that are often charged for it. COPYRIGHT 2019 SHEPTON CLASSIC STONE. ALL RIGHTS RESERVED.